Harris, Carolyn. "Sovereign". 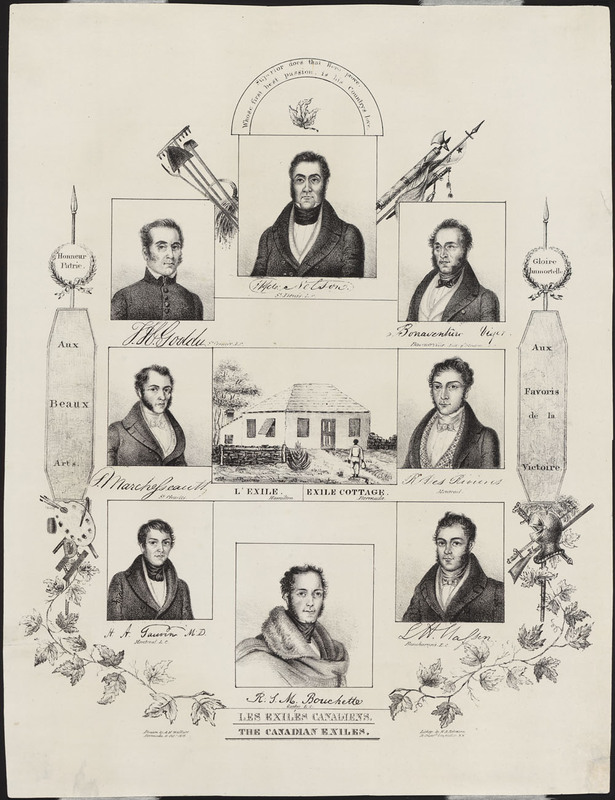 The Canadian Encyclopedia, 25 January 2018, Historica Canada. https://www.thecanadianencyclopedia.ca/en/article/sovereign. Accessed 21 April 2019. Under Canada’s constitutional monarchy, the sovereign is head of state, the legal foundation of the executive branch of government and one part of Parliament — along with the Senate and House of Commons. The current sovereign of Canada is Queen Elizabeth II. 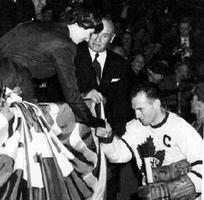 Queen Elizabeth II meets Maple Leaf captain Ted Kennedy on the sovereign's first visit in 1951. Conn Smythe presides (courtesy Hockey Hall of Fame). Under Canada’s constitutional monarchy, the sovereign is head of state, the legal foundation of the executive branch of government and one part of Parliament — along with the Senate and House of Commons. The current sovereign of Canada is Queen Elizabeth II. The sovereign is represented in Canada by the governor general, lieutenant-governors and territorial commissioners and acts on the advice of the prime minister, the head of government. 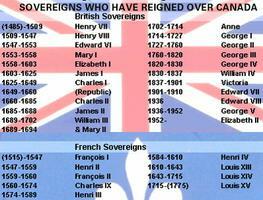 Thirty-two sovereigns from British and French royal houses have reigned over Canada or regions that became part of Canada. The earliest example of a European monarch claiming sovereignty over territory that eventually became part of Canada is King Henry VII of England, who supported John Cabot’s expeditions in the late 1490s. In 1534, King Francois I of France sponsored an expedition led by Jacques Cartier, who claimed land on the shores of Gaspé for the King. King Louis XIV made New France a Crown Colony in 1663. In 1670, King Charles II granted the Hudson Bay drainage basin to The Governor and Company of Adventurers of England trading into Hudson's Bay, which developed into the modern Hudson’s Bay Company (see Rupert’s Land). Following the Treaty of Paris in 1763, the nature of monarchical government changed in what is now Canada, as French absolutist monarchy was replaced by British constitutional monarchy, which had existed since William III and Mary II accepted the Bill of Rights presented by parliament in 1689. The Constitution Act, 1867 retained Queen Victoria and her heirs and successors as the source of executive authority and as one part of Parliament — a government modelled on Britain’s Westminster parliamentary monarchy. In 1931, the Statute of Westminster codified the divisibility of the Crown, making the sovereign of Canada a separate office from other positions held by the monarch. The sovereign would henceforth act on the advice of Canadian ministers in his or her capacity as monarch of Canada. George VI was the first sovereign to undertake duties as head of state on Canadian soil. During his 1939 Canadian tour with Queen Elizabeth, he gave royal assent to Canadian bills in the Senate chamber. The 1947 Letters Patent delegated nearly all of the sovereign power in the Canadian constitution to the governor general. In 1952, the Canadian royal styles and titles were amended to give the new sovereign, Elizabeth II, the official title of the Queen of Canada. 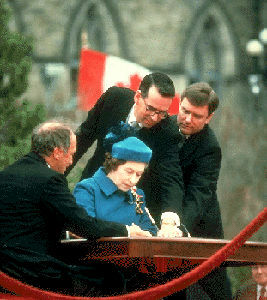 With the patriation of the Canadian constitution in 1982, the office of Queen was placed under the unanimous amending procedure, the strongest degree of constitutional protection (see Constitutional History). The sovereign’s duties include granting royal assent to legislation that has been passed by the House of Commons and Senate, opening parliament and reading the speech from the throne, holding the powers of commander in chief, and inviting the prime minister to form government. As per the 1947 Letters Patent, these authorities are now exercised in the sovereign’s name by the governor general. 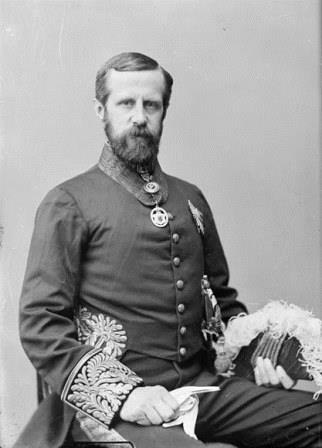 The sovereign retains the power to appoint and dismiss governors general, as well as appoint additional senators under section 26 of the Constitution Act, 1867. The current sovereign of Canada is Queen Elizabeth II, who succeeded to the throne in 1952. The reign of Elizabeth II’s father, George VI saw the development of a Commonwealth of equal nations from the former British Empire. Following the amended Canadian royal styles and titles, the Queen was the first monarch to be crowned and titled as Queen of Canada. The Queen’s full Canadian title is "Elizabeth the Second, by the Grace of God, of the United Kingdom, Canada, and Her other Realms and Territories Queen, Head of the Commonwealth, Defender of the Faith." The Queen has toured Canada 20 times with her consort, Prince Philip, the Duke of Edinburgh. The sovereign is determined by a process of hereditary succession determined by the Act of Settlement passed by England’s parliament in 1701. The current heir to the throne is Queen’s eldest son Charles, Prince of Wales, followed by his son Prince William, Duke of Cambridge and grandson Prince George. The Act of Settlement restricted the succession to the Protestant descendants of Sophia of Hanover, a granddaughter of King James I of England/James VI of Scotland. Her son succeeded as King George I upon the death of the last Stuart monarch, Queen Anne, in 1714. The Act of Settlement superseded previous lines of succession but drew upon existing common law including the inheritance rights of sons taking precedence over those of daughters, a system known as “male preference primogeniture.” In 2011, the Commonwealth Heads of Government agreed in principle to succession reform that would introduce absolute primogeniture, allowing the eldest child of the monarch, male or female, to be first in the line of succession. The reforms also allowed monarchs to be married to Roman Catholics, which had been forbidden by the Act of Settlement. In 2013, Canada passed An Act to assent to alterations in the law touching the Succession to the Throne, formally assenting to the succession reform in Britain. The Act attracted political controversy and a Québec court challenge regarding the question of whether the law of royal succession is determined by the British parliament. The challenge was dismissed. Succession reform went into force throughout the Commonwealth in 2015. The role of hereditary principle in the selection of Canada’s sovereign has been critiqued as being out of keeping with Canada’s modern democracy. The Queen resides in the United Kingdom most of the time, which has also prompted criticism of Canada having a non-resident head of state. There have been high profile examples of new citizens from a variety of backgrounds challenging the allegiance to the Queen in the citizenship oath. Defences of the current method of selecting the sovereign observe that a non-resident, hereditary monarch is entirely separate from political partisanship within a Canadian context. See also Crown; Royal Tours. MONARCHY AND THE CROWNCanada is a constitutional monarchy. Discover how the Crown in Canada has evolved and remains an essential and relevant component of our identity, contributing to a sense of unity and pride among Canadians. From the Government of Canada. A CROWN OF MAPLESConstitutional monarchy in Canada. Intended to make information on the Canadian Monarchy available to Canadians in an interesting and meaningful format. From the Government of Canada.